Welcome back to Inspired By Zelda! 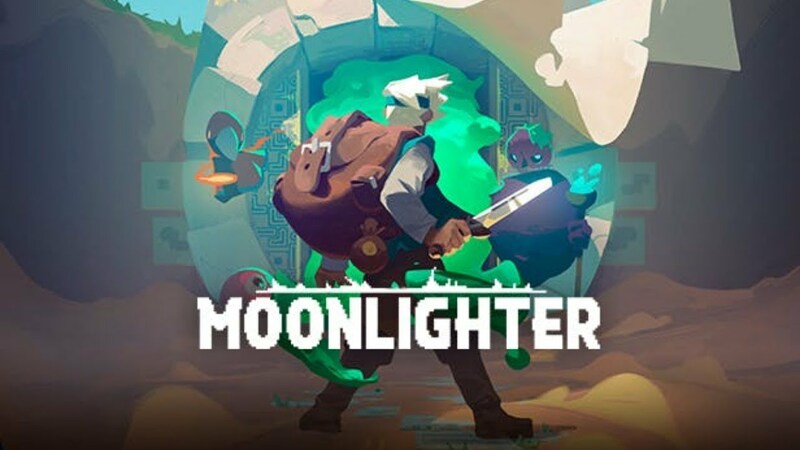 Today on the docket… Moonlighter, an action RPG developed by Digital Sun and published by 8 Bit Studios where you run a shop by day, and loot dungeons by night! Moonlighter is available on Nintendo Switch, PS4, Xbox One, and Steam! I’ve never been a big fan of “life simulation” games, for lack of a better term. Games like Stardew Valley, Harvest Moon, The Sims, and even Nintendo’s own take on that genre, Animal Crossing… they just never did it for me. I like my games to have a point, a definitive start and end, otherwise I just feel like ‘what am I doing?’ if there’s no payoff to the hours I’ve put in. Not saying that’s right or wrong, but it’s always how I’ve looked at those types of games. 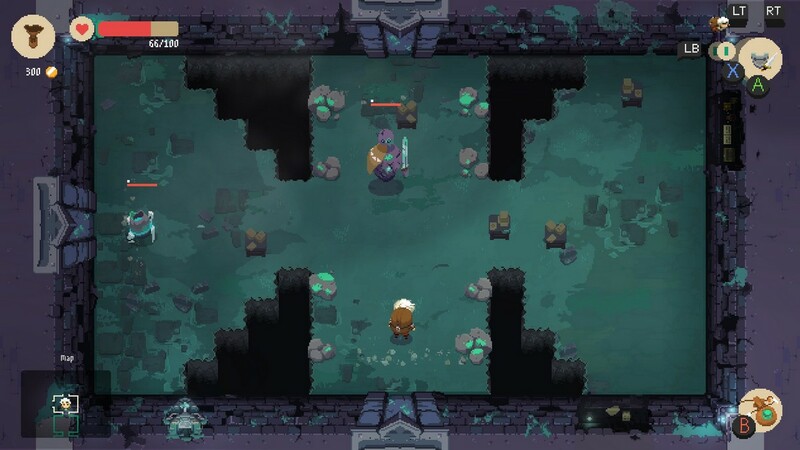 All of this is to say that nobody was more surprised than me by how much I enjoyed Moonlighter. For anyone coming in blind, I’ll quickly give you the scoop on Moonlighter: you are a local boy named Will who owns a shop named the Moonlighter in the village of Rynoka. By day, you sell trinkets and artifacts to the locals that have been found in dungeons near the village. By night, you raid those dungeons to find those trinkets, going from room to room, defeating monsters and snatching their dropped loot to bring back to the shop. It’s a super simple premise, but one I found strangely addicting. There are four dungeons to go through, although initially three are locked off, with each having its own theme and unique monsters inside. Each dungeon has three levels, with each level having a boss that guards access to the next level. Beat the third levels boss, and you unlock a new dungeon. The feel of this game should not only be familiar to anyone that’s played a top-down Zelda, but to players who have went through the Binding of Isaac as well, a game covered in this series before. You have different armor and weapons that you can use and upgrade throughout the game to help you on, as each level and each dungeon gets progressively harder and harder. Again, it’s a super simple system, but it works. Like Binding of Isaac, all the rooms in these dungeons are randomly generated, so you never have the same playthrough twice. Again, when I was playing Moonlighter, I was surprised by how much I was enjoying my time, because I have to admit, I wasn’t a huge fan of Isaac. But there is definitely something rewarding about filling up your inventory to the max with lots of goodies you know you’re gonna make bank on when you get back to the shop – if you get back to the shop. Some of the rooms and enemies in this game are really tough, and if you die, you’re toast, and you can kiss all that sweet loot you’ve pillaged goodbye. That’s probably my least favorite part about Moonlighter, actually. It’s super frustrating losing all of the items you’ve collected, and I could see it being a turn off for some players. What this game needed was a loot recovery mechanic, à la Shovel Knight, where if you died, your goodies would be in a bag in the same place you died and you had a chance to get it back. Something along those lines would have went a long way, but it is what it is. Combat is nice and simple, again, feeling very reminiscent of the Zelda games of old. You have two main weapons which can be swapped in and out, so being me being the Zelda freak that I am, I stuck with the Sword/Shield and Bow/Arrow combo to get me through the dungeon’s and their bosses, most of which are pretty cool and fun. Unfortunately, the difficulty doesn’t necessarily scale like you’d hope, so by the time I was in the fourth dungeon, I had so much money from selling loot from the later dungeons at such an insanely high price that I had all the best weapons, armor, and potions, making the final dungeon and its boss pose about as much of a threat as a newborn kitten. This was kind of a let down, but on the other hand, I also felt vindicated for all the extra time I had spent going back into the same dungeons, grabbing more items, and selling, selling, selling. Those fears were quickly put to rest, though, the first time I felt that rush of a customer deciding whether or not to buy an item that I felt I had overpriced and watching them decide to pay full price for it. Customers head up to an item and make a face about it – that’s how you know if you’ve overpriced an item, under-priced it, or it’s just right. I’ve seen others complain about this system before, and I can see where these people are coming from: keeping a better track record of what items have sold for previously, the customers reactions, a better way to track whether the item is in demand or not, are all things that would have went a long way. You do have a book that’s supposed to be keeping track of all this, to be fair, but I found it pretty cumbersome, unintuitive, and not very useful. It’s also annoying that certain items can’t be stacked into bigger groups (say for instance, you have 4 spots where you can display items to sell, and 20 of a particular item… if this item can only be sold in bundles of 5, you need to put out 4 bundles or 5 if you wanna sell all 20). It’s also kind of lame how often thieves come in to your shop to try and steal your stuff, or how if people wait in line too long (usually while you’re off attending to said thieves) they think it’s cool just to walk out of your store without paying for the item (where are the police in this town?). Saying all this though, I just keep coming back to that rush when you’re selling something and it’s a new item and you don’t know if you’ve overvalued it or undervalued it and that customer comes up and his face starts to light up, they buy it, and you watch your money just pile up… it’s awesome, and at the end of the day, what I enjoyed most about Moonlighter. 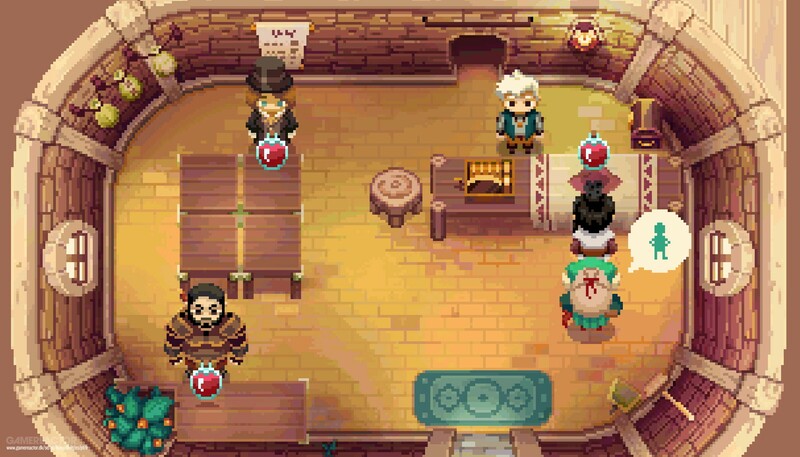 In this game, with more money does not come more problems, as you can pimp your shop with decorative items that help cut down on the aforementioned thieves, extended shop hours, make your customers more patient, and expand the place so you have more display room to sell more items. Likewise, you can spend money on the town of Rynoka, to bring in armorers, merchants, even investment bakers, to help you in your nightly activities. I really can’t put over enough how much of a thrill something as simple as selling scrap from a dungeon to a bunch of nameless NPC’s was, but I had an absolute blast doing it, and whether or not you can see yourself getting into that will probably make or break this experience for you. 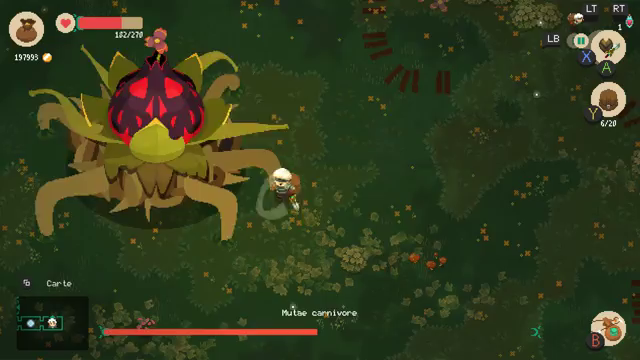 On a technical level, Moonlighter looks and sounds great. I really dug the pixel-y, Hyper Light Drifter style of art, and the music in this game – while not plentiful in the amount of tracks that it offers you – has some really good tunes that were easy to get stuck in my head. When there’s a lot of enemies on the screen, the games performance can dip a little bit, but I never ran into room where it became an active problem – maybe I’m more forgoing for that sort of thing, but it never bothered me. There’s not really much of a story beyond the mystery of why these dungeons are here and how to unlock them, but I found the game charming enough to get away with that, which I was again surprised by, since I am very much a story-driven gamer. All in all, if you’re a Zelda fan and you’re looking for something a little bit more different, or have ever wondered where some of the series’ most famous merchants might have gotten their goods from, this may be for you. Any Binding of Isaac fans are sure to enjoy this, and anyone who’s ever loved Animal Crossing but wished there was just a bit of action will probably dig this too. I had a blast with it and put in a solid 30 hours into my experience. This is one of the better titles I’ve had the opportunity to play so far in this series, and I feel good telling a fellow Zelda fan to check it out. Who knew running a shop could be so much fun? That’s gonna do it for Inspired By Zelda for this month, but don’t worry – we’ll be back next month before you know it, going on a journey unlike any we’ve gone on before: one through systems, hardware, years, and bits! Until then! Andy Spiteri is the Editor-In-Chief of Zelda Dungeon. For the next two months, all he’ll be tweeting about is playoff hockey, so make sure you follow him on Twitter!